Acquired: Signed as a free agent on Feb. 13, 2018. 2018: In 18 games (18 starts), Bazzie finished with 39 defensive tackles, eight quarterback sacks, one forced fumble and one fumble recovery. 2017: (BC) Bazzie appeared in six games where he recorded 14 tackles and four quarterback sacks. 2016: (BC) Bazzie appeared in 18 games for the Lions where he led his team in sacks with 11 and also recorded 31 tackles and one forced fumble. Bazzie earned West All-Star Honours for his effort. 2015: (BC) Bazzie appeared in 15 games where he recorded 24 tackles and eight quarterback sacks. 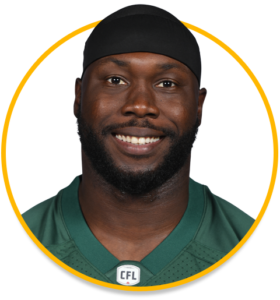 2014: (BC) In his first season in the CFL, Bazzie recorded 36 tackles, 10 sacks, and one forced fumble in 17 games played. Pro: Bazzie spent time in the NFL in 2017 with the Indianapolis Colts, Carolina Panthers, and Arizona Cardinals. College: Bazzie attended Marshall from 2010 – 2013 where he appeared in 45 games and recorded 175 tackles, 23 for a loss, and four sacks. In 2013, Bazzie recorded 80 tackles.